Edinburgh Capitals, regardless of tomorrow’s result at Dundee Stars, will cement a Challenge Cup quarter-final place with a win over Fife Flyers at Murrayfield on Sunday (face-off 6pm). And in-form forward Jared Staal believes a “tight-knit group” is the main reason behind a great start to the season for the small-budget club, with four victories in their past four games. The former Carolina Hurricanes winger has had a whirlwind start to his career in British ice hockey, scoring five goals and adding four assists in his opening six games. He tops the team’s scoring charts, and this week was voted player of the week by fans up and down the country in a social media poll. The Canadian, who has played the majority of his career in the American Hockey League, icing in just shy of 250 games, seems to be settling in well to his new surroundings with wife Natalie after being snapped up by Edinburgh in a summer move. “Me and my wife were looking to head over to Europe and start a new adventure and Edinburgh was one of the first teams to reach out,” said Staal. “We looked into the city and the league and heard a lot of good things and it was as simple as that. Staal – who in 2013 made NHL history when, along with brothers Eric and Jordan, iced for Carolina in the same game – arrived in the city with a reputation as a player with an excellent two-way game, and strength on the puck. Not necessarily his eye for goal. Staal said: “It seems to be working out so far, but I know throughout the season you go through some ups and downs and right now I seem to be in the right spot at the right time and finding the back of the net. I’ve been fortunate so far, but I know it’s not going happen like this all season so when it does, I’m going to enjoy it. Edinburgh’s injury problems look to be clearing up ahead of tonight’s Dundee clash, player-coach Michal Dobron will ice and the club are hopeful of a return for Garrett Milan, although forwards Ian Schultz and Karel Hromas are set to be sidelined for at least another week. 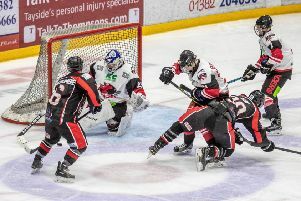 Staal, who scored the overtime winner in Fife last Saturday to give Edinburgh their first win in Kirkcaldy in almost three years continued: “I was surprised at how long it was since the last time we won in Fife so, especially for the guys who’ve been around longer, to get a win there was very special.